We’ve recently invested in a few shiny new toys to help us to create great videos. Expect to see a lot more video content from us! Creating quality video content doesn’t have to be expensive. If you’re planning to up your game this year and share more video content on social this article is for you. 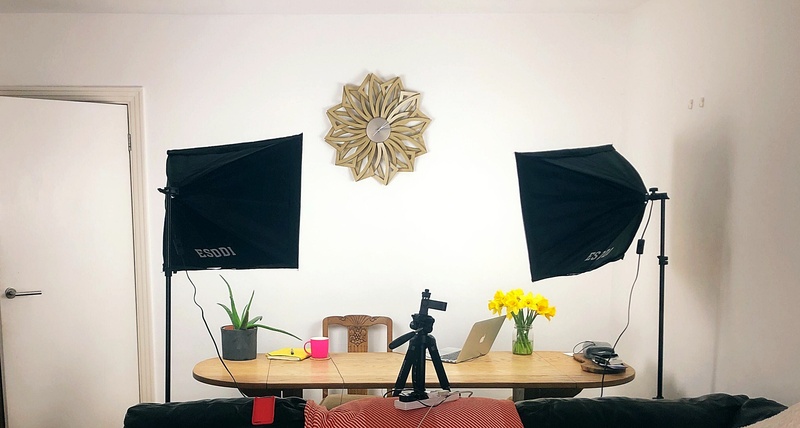 We decided to share the most important but also budget-friendly tools that you’ll need to create professional looking videos within the comfort of your home or office. Here is the list of the kit we’ve purchased and tested along with links. Don’t worry if you cannot find the exact same product but hopefully it’s a good guide so you can research similar ones. You simply need your smartphone, expensive equipment is not necessary. As long as your camera is working well, you’re ready to film! Read our tips from the Smartphone Video Masterclass or sign up for the next one to learn how to shoot amazing videos on a budget. We film our videos with an iPhone and then edit them with iMovie. An essential part of your filming kit as it keeps your camera/phone stable so you’re not shooting Blair Witch style. If you are planning to use additional lights you’ll need to use tripods for them as well. An additional tool that we recommend is a 360-degree rotation mount holder with an adjustable clamp to be used on your tripod. It will allow you to rotate your phone in whichever way you want – from portrait (vertical) mode to landscape (horizontal) mode without having to take your phone out from the adapter. Natural light is very important but it often changes quickly throughout the day and you don’t want to see too many shadows or too much sunlight that is damaging the quality of the video and distracting the viewer. We use studio lights that provide natural light and help to get rid of the shadows that often are created by the natural sunlight. If you’re using an iPhone 8 or newer versions you’ll have to buy an adapter for the microphone because of the difference in the headphone socket. To improve your sound don’t forget about the additional microphone. It makes such a big difference, especially if there is any background noise where you’re filming. It’s very useful for voice-overs as well. It’s worth getting an extension cable for your microphone so you can use it from any distance without being limited and having to film too close to the tripod. Video marketing is getting more and more popular on social, bringing the best ROI (Return on Investment) with outstanding results not only from your Facebook campaigns but also generating more engagement on other platforms too. It’s then worth to tool yourself up and start creating professionally looking films without having to spend loads. If you’re looking to learn more about creating awesome videos join our Smartphone Video Masterclass on June, 6th.